Bear-baiting is a blood sport involving the worrying or tormenting (baiting) of bears. Bear baiting is an ancient sport in which spectators sit in an arena and watch dogs attack a chained bear. Traditional bear baiting is outlawed in the United States, but a modern variation is still legal and practiced all over America. In the new format, student-loan debtors substitute for the bear, lawyers and judges take the place of vicious dogs, and the venue has been changed from sporting arenas to the bankruptcy courts. Here are some bear-bating examples. Jane Roth, a 68-year old woman with chronic health problems, filed for bankruptcy to discharge more than $90,000 in student-loan debt--almost three times more than she actually borrowed. At the time of her bankruptcy filing, Roth was living on $774 a month, and it was clear she would never pay back the 90 grand she owed. Educational Credit Management (ECMC), her main creditor, opposed a bankruptcy discharge and litigated the matter all the way to the Ninth Circuit's Bankruptcy Appellate Panel. It must have been great fun for the lawyers, and I'm sure they were well paid for harrying Ms. Roth. Unfortunately for ECMC, the Ninth Circuit's BAP put an end to the fun, and discharged Ms. Roth's student-loan debt, ruling it would be futile to put her in a long-term loan repayment plan. And here is another example. Janice Stevenson, a woman in her 50s, filed for bankruptcy to discharge $114,000 in student-loan debt, far more than she originally borrowed. Stevenson had a record of homelessness, and at the time of her bankruptcy proceeding, she was living in publicly-subsidized housing on an income of $1,000 a month, which included short-term unemployment benefits. Judge Joan Feeney, a Massachusetts bankruptcy judge, refused to discharge Ms. Stevenson's student loans in bankruptcy. Instead, the judge concluded that Ms. Stevenson was a candidate for a long-term income-based repayment plan, a plan that would obligate her to make student-loan payments for 25 years--a half century after she took our her first student loan! In my view, the attorneys in the Roth case, the Stevenson case, and dozens of other student-loan bankruptcy cases, are bear baiters. Debtors stand utterly defenseless in the bankruptcy courts--many without lawyers--like chained bears, while heartless attorneys for the Department of Education, ECMC, or another student-loan creditor make sport of their plight. The creditors' attorneys get paid and go home to eat nice dinners and dream of their next exotic vacation. And all too often, student-loan debtors walk out of the bankruptcy courts facing almost a lifetime of indebtedness that they cannot discharge. So this is the national situation: Over 40 million people owe money on student loans, and at least 20 million are unable to pay it back. Seven million have defaulted, while others are delinquent or in deferment plans or long-term income-based repayment plans. Millions of people are their seeing loan balances grow due to accruing interest, penalties, and collection fees. In fact, it is not uncommon for people to owe two or even three times what they borrowed. Most of these people deserve relief, and the only place they will find it is in the bankruptcy courts. Fortunately, a few compassionate bankruptcy judges and federal appellate courts are ruling in favor of student-loan debtors and granting them relief from their crushing debt. The Roth case, in particular, is hugely important, because the Ninth Circuit's Bankruptcy Appellate Panel applied principles of equity to discharge Jane Roth's debt. But only time will tell whether the bankruptcy courts will be places where honest but unfortunate debtors can find relief or whether they will continue to be bear-baiting arenas. "Close, but no cigar," a Google search tells me, means an attempt that is not quite successful. This should be our response to presidential candidate Jeb Bush's plan to fix the student loan crisis. He proposes to scrap the present student-loan scheme and replace it with a new program whereby all high-school graduates will be given a $50,000 line of credit that they can draw on for postsecondary education. Students will pay back the loan by paying 1 percent of their income for every $10,000 borrowed, to be paid back over 25 years. Borrowers would make their loan payments on their federal income tax forms. Second, Mr. Bush proposes to make it easier for students to discharge their private student loans in bankruptcy, although the details aren't specified. This idea has also been endorsed by President Obama and several scholarly commentators. Third, Mr. Bush wants to improve information about higher education outcomes at colleges and universities, and he will encourage innovation and flexibility in postsecondary programs to help bring down tuition costs. Finally, Bush's plan proposes to require colleges to pay back some of the loan money their students borrow if the students default. He believes requiring colleges to have "some skin in the game," will make them operate more responsibly and give them an incentive for their students to be successful. So what's not to like about Jeb Bush's plan? Several things. For-Profit Institutions Must Be Reined In. First, Governor Bush's plan does nothing to rein in the for-profit college sector, where the worst student-loan abuses are taking place. Indeed, Governor Bush's own state of Florida is notorious for allowing for-profit colleges to operate without proper regulation. Investigative reporters revealed that the Florida for-profit industry has gotten legislation passed to favor their interests by making strategic campaign contributions. Dade Medical College, which recently closed, is one of the most notorious examples of a for-profit college industry gone wild. Dade Medical College was run by a high school dropout with a criminal record and received more than 80 percent of its revenues from the federal student-aid program. Bankruptcy Relief Must Be Made Available to All Student Debtors, Including Those Who Participated in the Federal Student Loan Program. Mr. Bush's proposal to make it easier for private student-loan debtors to file bankruptcy is a good one, but federal-student-loan borrowers must also have reasonable access to the bankruptcy courts. Millions of people have defaulted on their federal student-loans, and those who took out student loans in good faith and fell on hard times are entitled to a fresh start through the bankruptcy process. We've Got To Stop Garnishing Social Security Checks of Elderly Student-Loan Defaulters. Currently, the federal government is garnishing Social Security checks of 155,000 elderly student-loan defaulters, which federal law empowers it to do. No one who is totally dependent on Social Security should have his or her Social Security check garnished because of a defaulted student loan. Let's say no to all long-term repayment plans. Personally, I believe the American people should say no to all proposals that require students to pay back their loans over 20 or 25 years. These plans are designed to lower students' monthly loan payments but they require student-loan borrowers to make payments for the majority of their working lives. And I feel quite sure that any long-term income-based repayment plan--whether it is crafted by President Obama or Governor Bush, will mean that a majority of student-loan debtors will never pay back the principal on their loans. Finally, the American people should vote no on any student-loan reform plan that pushes student-loan borrowers into long-term repayment plans. Who would have believed just 20 years ago that our national leaders are so inept at managing the student-loan crisis that they think it is a good idea to push young Americans into plans that force them to pay on their student loans for 20 or 25 years. Trouble in Paradise: Thomas Jefferson Law School is sued by one of its graduates, who accuses the school of "fraudulent business practices"
Law school, it has been said, is the best option for people who want to make a lot of money but are risk adverse. Once, there was once a lot of truth in that observation. Twenty-five years ago, law-school graduates had great employment opportunities. People graduating from the most prestigious law schools commanded very high salaries, and even people who graduated from second-tier schools and had mediocre grades had a fair chance at earning a decent living. But that is no longer true. The job market for attorneys has collapsed. There is a massive glut of lawyers in the United States, and there is now only about one job available for every two law-school graduates. At the same time, tuition rates at the nation's law schools has shot up. To cite one example, it now costs 36 times more to attend the University of Texas School of Law than it did when I was a student there 35 years ago (from $1,000 a year to $36,000 a year). Today, most people can't attend law school without borrowing a lot of money, and job prospects for people who graduated from second- and third-tier law schools are not good. Thousands of law-school graduates are carrying student-loan debt that they can't repay. Unfortunately, some law schools continued to tout high employment rates for their graduates--rates that bore no resemblance to reality in a falling job market. Some graduates are claiming they were enticed into attending law school by false representations that there were good jobs awaiting them when they graduated. Clark Moffatt sues his alma mater for "fraudulant and deceptive business practices." This brings me to the case of Moffatt v. Thomas Jefferson School of Law. Clark Moffatt, a 2009 graduate of TJSL, filed a lawsuit against his alma mater in 2014, alleging "fraudulent and deceptive business practices." Moffatt claims he decided to enroll in TJSL based on the school's representation that a high percentage of its graduates got jobs. The law school's employment statistics were published in U.S. News & World Report. Reasonably relying on TJSL's representations, Moffatt says, he borrowed about $100,000 to pay TJSL's tuition. TJSL's representations, Moffatt alleged, were "false, misleading, inflated, and inaccurate." According to Moffatt, TJSL claimed that 92.1 percent of its 2009 graduating class were employed nine months after graduation, which suggested that more than 90 percent of its graduates were working in full-time, law-related positions. In fact, Moffatt charges, those employment figures included people who were working part time or in non-law related jobs. "In other words, if graduates accept part-time employment working as a waiter or a clerk at a convenience store, they are considered to be 'employed nine months after graduation.'" Moffatt claimed that TJSL categorized many people who were not working in law jobs as being employed in "business/industry," including people working in unskilled positions. "TJSL admits that its policy is to categorize all unskilled labor positions as 'business/industry,' including TJSL graduates who are employed as a stripper, cocktail waitresses, and restaurant servers." In spite of a plummeting job market for lawyers, Moffatt said in his complaint, TJSL increased the number of students it enrolled each year, and it also lowered its admission standards. In 2005, the law school accepted only about one applicant out of four. By 2012, "TJSL's acceptance rate jumped to 73 percent. In 2013, according to Moffatt, TJSL accepted more than 4 out of 5 applicants. Most of TJSL's students borrowed money. Indeed, Moffatt's complaint alleges, the New York Times reported in 2011 that TJSL led the nation's law schools in student indebtedness, with 95 percent of students graduating with debt. The average debt load for TJSL graduates, Moffatt said in his complaint, is $180,000! Moffatt's complaint in Moffatt v. Thomas Jefferson School of Law is 18 pages long and well worth reading. Its description of TJSL's policies, if accurate, shows a a mediocre law school with very high tuition and high levels of student debt increasing its enrollment and dropping its admission standards during a falling job market for lawyers. Not a pretty picture. Will Clark Moffatt win his law suit? The Moffatt case is scheduled for trial in March of this year. It may be settled before trial; and in fact, the case may already have been settled under terms that were not publicly disclosed. It is common for institutions to settle high-profile litigation like the Moffatt case under terms that forbid the parties from disclosing any details. This is how the Catholic Church settled many of the priest abuse lawsuits that were filed against it. Even if the case goes to trial, Clark Moffatt may lose. Graduates of Thomas M. Cooley Law School lost their fraud case against a Michigan non-profit law school. The Sixth Circuit Court of Appeals ruled that it was unreasonable for the law school's graduates to rely on the school's salary statistics. And a student at Arizona Summit Law School lost her fraud claim against a for-profit law school operated by Infilaw Corporation. Judges may be reluctant to rule against law schools in cases like Mr. Moffatt's. If he wins, then hundreds of Thomas Jefferson law graduates might also have valid claims. And a fraud judgment against a law school would open the door for former students to petition the Department of Education for student-loan forgiveness. One judgement against a law school based on facts like those Moffatt alleged could have cascading financial consequences. Why is Moffatt v. Thomas Jefferson School of Law significant? Regardless of the outcome, Moffatt v. Thomas Jefferson School of Law is a significant case because it illustrates the high risks that students run when they borrow money to enroll in law school--particularly second- and third-tier schools like Thomas Jefferson, Arizona Summit, and Thomas M. Cooley. Tuition at all these schools is extremely high, and most students must take out student loans in order to pay their tuition bills. Obviously, people who attend these schools hope they will find a good job after graduation that will justify six-figure debt loads. As Clark Moffatt said in his complaint, "Nobody attends law school to get a job as a convenience store clerk." Nationwide, law-school enrollment levels are dropping as many intelligent individuals conclude that going to law school is not longer a good financial bet. But law schools have not lowered their enrollments enough to match the falling demand for lawyers. Instead, many have kept their enrollment-levels high while lowering their admission standards. Some law schools have admission standards so low that a majority of their graduates are at high risk of failing the bar exam. The law schools have not been responsible in addressing the imploding job market for lawyers. They admit too many students, and their tuition rates are too high. In my view, there is no justification for the stratospheric rise in law-school tuition. Some law-school graduates who were unable to find well-paying legal jobs have filed for bankruptcy, but the courts have not always been sympathetic. In Tetzlaff v Educational Credit Management Corporation, for example, the Seventh Circuit Court of Appeals refused to discharge the student-loan debt of a law-school graduate who graduated from a bottom-tier law school with mountains of debt and who had failed the bar exam twice. In my opinion, American law schools have put revenues ahead of their students' welfare, and the American Bar Association has not policed legal education in a responsible way. Thus far, unemployed and underemployed lawyers who are swamped by student-loan debt have only two options for relief. They can file for bankruptcy, hoping to discharge their debts in the bankruptcy courts. Or they can do what Clark Moffatt did and sue their alma maters for misrepresentation. Lorona v. Arizona Summit Law School, No. CV-15-00972-PHX-NVW, 2015 U.S. Dist. LEXIS 168862 (D. Ariz. Dec. 16, 2015). McDonald v. Thomas M. Cooley Law School, 724 F.3d 654 (6th Cir. 2013). Moffatt v. Thomas Jefferson Law School, No. 37-2014-00033723-CU-PN-CTL, filed in California Superior Court for the County of San Diego, Oct. 2, 2014. Senators Elizabeth Warren and Charles Schumer spoke on CNN news program about the student loan crisis and said ABSOLUTELY NOTHING! President Obama will give his State of the Union address tonight and is expected to address the student loan crisis. In anticipation of that event, Senators Elizabeth Warren and Charles Schumer came on CNN television this morning to speak about student loans, and both said ABSOLUTELY NOTHING! First of all, both mouthed the old canard that the government is making a profit off the student loan program because it is lending money at a higher interest rate than it pays to obtain the money. It is true that the interest rate on the 10-year treasury note is about 2. 2 percent, while the federal student-loan program charges approximately 6 percent. But of course, the government is only making a profit on student loans if students pay back the money--and a high percentage of them do not. As the Brookings Institution reported recently, 47 percent of the students from a recent cohort who borrowed money to attend for-profit colleges defaulted on their student loans within five years. That's pretty darn near half. And that number does not include the borrowers who are on economic hardship deferments or long-term repayment plans who are seeing their loan balances grow larger due to accruing interest. The same Brookings report noted that over 70 percent of students who attended for-profit institutions were seeing their loan balances go up two years after entering repayment. In fact, among student borrowers as a whole, more than half (57%) saw their loan balances go up two years after entering the repayment phase of their loans. People in repayment whose loan balances are growing are either in default, in deferment, or in long-term repayment plans. For almost all these people, their student-loan debt is growing larger during the repayment phase, not smaller, due to accruing interest. The government can pretend that all that accrued interest is an asset because someday millions of student loan borrowers will pay back their loans, but that is baloney. The government is not making a profit on the student-loan program, and Senator Warren and Senator Schumer either know that and are being purposely deceptive or they are fools. Here's a second point to make about Senator Warren and Senator Schumer's CNN interview. NEITHER SENATOR MADE A SINGLE SUGGESTION ABOUT HOW TO SOLVE THE STUDENT LOAN CRISIS. My guess is they will support a bill to lower interest rates on student loans. Senator Warren has ridden that hobby horse before. But neither senator said anything about the government's practice of garnishing elderly people's Social Security checks. Neither said anything about the insanity of putting millions of borrowers into long-term student-loan repayment plans that will result in massive amounts of student-loan debt being forgiven. Neither said anything about reforming the bankruptcy process for distressed student-loan debtors. Why? Because Senator Schumer is a lackey of the banking industry, and Senator Warren is a lackey of the higher education industry. The fact that these idiots stepped forward to talk about the student loan crisis on CNN without saying anything at all is disgraceful. In fact it is frightening. Saving Private Ryan, directed by Steven Spielberg, realistically depicts American soldiers landing in Normandy on D Day, June 6, 1941. As the film accurately represented, many soldiers were killed as they left their landing craft, cut down by machine guns or artillery fire before they ever set foot on the beaches. Something similar happens to people who default on their student loans. From the moment their student loans go into default, they are dead in the water. Bible v. United Student Aid Funds, Inc. illustrates my point. Bryana Bible borrowed $18,000 to finance her college studies. She defaulted in 2012, but she promptly agreed to a rehabilitation agreement that allowed her to make reduced monthly payments of only $50 a month. The interest rate on her rehabilitated loan was set at 6.8 percent. Although Bible faithfully abided by the terms of the rehabilitation agreement, a loan guarantee agency assessed $4,547.44 in "collection costs" against her, increasing her total indebtedness to more than $22,500. When Bible began making $50 monthly loan payments, the guarantee agency applied the payments to the collection costs, not the loan's principal. In short, Bryana Bible was dead in the water. It would take her more than seven years just to pay off the collection costs on her debt. In the meantime, her loan balance would be accruing interest at the rate of 6.8 percent! Bible sued the guarantee agency for fraud and racketeering, alleging she had been told that costs against her were zero. Last August, the Seventh Circuit Court of Appeals ruled that she has a valid cause of action. The Seventh Circuit's decision is quite long--57 pages including a concurring opinion and a dissent. But it is not necessary to read the court's lengthy legal analysis to understand what happens to people who default on their student loans, even briefly. People who default on their loans can get slapped with collection fees amounting to 25 percent of their loan balance, and they can be put in repayment plans that cause their loan balances to go up because the payments aren't being applied to the principal of their loans. Once student-loan debtors fall into the clutches of the loan guarantee agencies, most of them can never get free. Collection costs, accrued interest and various fees get added to their loan balances, and their loan balances go up--not down. That's why we see distressed student-loan debtors stumbling into the bankruptcy courts owing two or three times the amount they borrowed. And who do they meet when they get to bankruptcy court? Attorneys for the loan guarantee agencies, who argue stridently that these poor souls are not entitled to bankruptcy relief. Bryana Bible's story would be a shocking even if her circumstances were unique. But there are millions of Americans who are unable to pay off their student loans, and most of them are seeing their loan balances go up with each passing month. 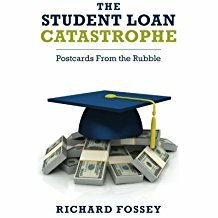 Whether it intended to do so or not, Congress created a federal student loan program that benefits the finance industry and pushes millions of student loan debtors into a financial abyss from which there is no escape. The program has destroyed higher education as a moral enterprise and created a modern-day class of sharecroppers who will be indebted to the government for their entire lives. It will take courage to fix this problem, but we can't look for courage from Congress or from our higher education leaders. I am convinced the only way to bring down this putrid, sleazy flim-flam game is for distressed student-loan debtors to march into bankruptcy court--with or without lawyers--and cry out for justice. Bible v. United Student Aid Funds, Inc., 799 F.3d 633 (7th Cir. 2015).